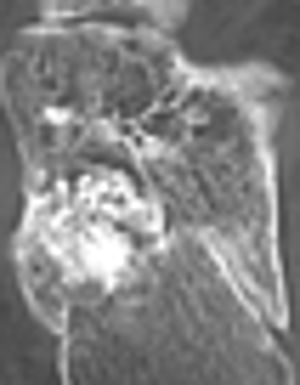 Plexiform neurofibromas are benign nerve tumors occurring in approximately 30% of patients with neurofibromatosis type 1. They develop as neural proliferations of single or multiple nerve fascicles, and are typically highly vascular in nature. 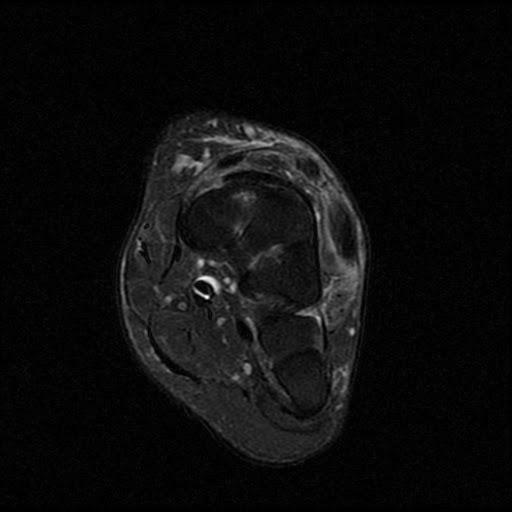 In this case report, we describe a 28-year-old male with a paternal family history of neurofibromatosis type 1 and a large plexiform neurofibroma of his left lower extremity present. 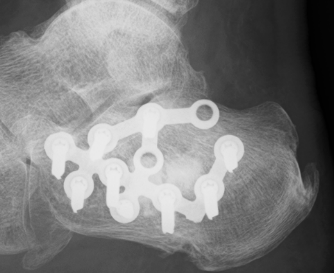 Following consultation and shared decision-making, the patient underwent surgical debulking primarily to reduce pain, to improve shoe gear fit, and to improve ambulation. A 28-year-old male with a past medical history of neurofibromatosis type 1 was seen for evaluation and management of a painful mass on his lateral left leg (Figure 1). He was no longer able to wear normal shoes, which in turn affected his activities of daily living. 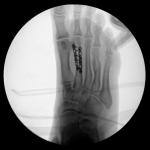 His surgical history included a prior debulking procedure of his left medial leg and foot at the age of 3. His social history included active tobacco use of a ½ pack of cigarettes a day, and had not graduated from high school. The patient related an extensive paternal family history of neurofibromatosis type 1, affecting multiple family members. 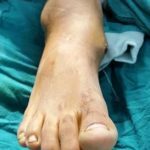 He reported a paternal family member passing away from a peritoneal malignancy caused by plexiform transformation into a malignant peripheral nerve sheath tumor. 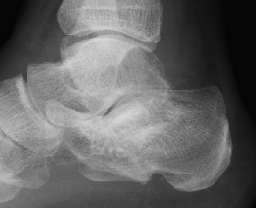 Figure 1 Preoperative weightbearing and nonweightbearing clinical appearance of the left lower extremity, depicting the large mass. 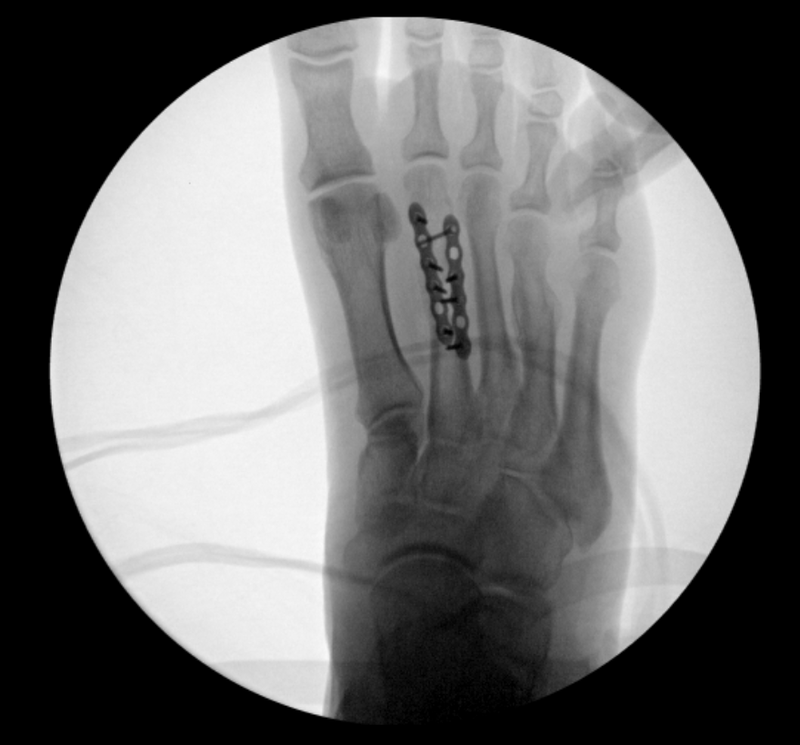 Preoperative surgical planning included a coordinated effort between podiatric and plastic surgeries. 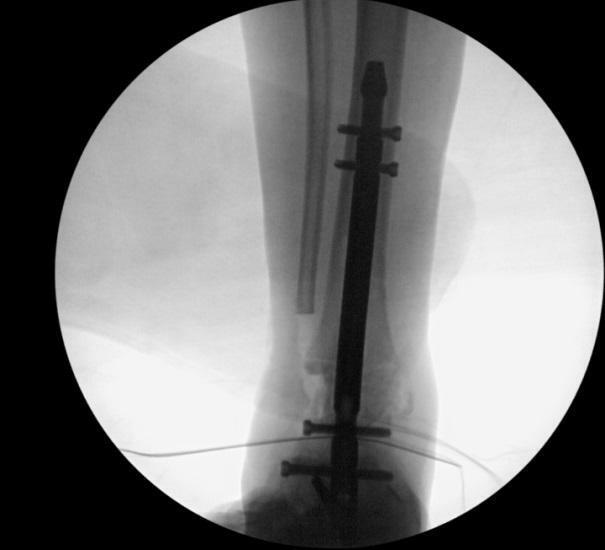 Surgical and conservative options were discussed in detail with the patient. 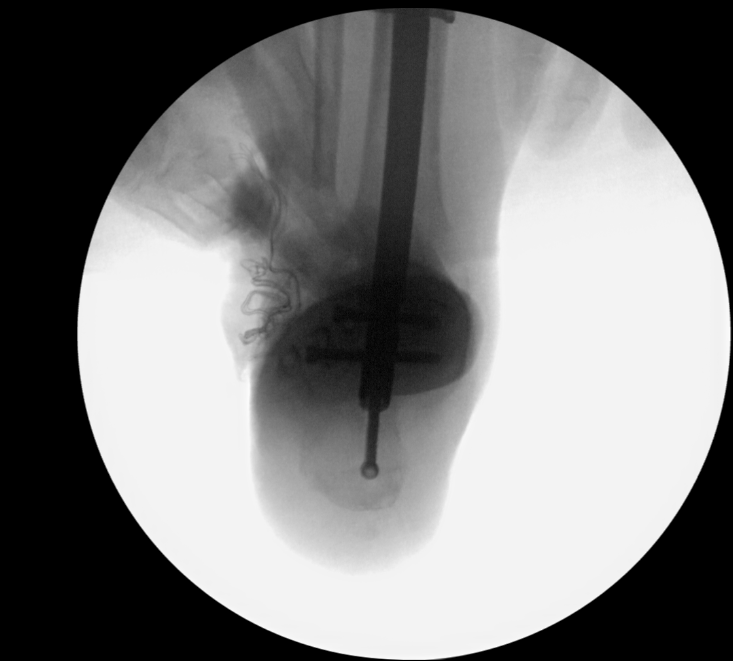 The elected plan for the surgery was to debulk the lateral leg mass, with the goal of reducing the associated pain and to allow the patient to fit into a shoe. 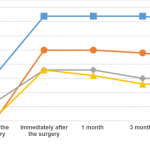 Risks and benefits were discussed in detail with the patient, and the patient was educated regarding the likelihood and speed of mass regrowth. 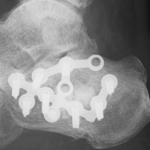 The patient underwent surgical debulking as an outpatient. 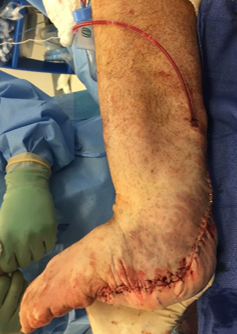 Preoperatively, blood was typed and crossed in anticipation of blood loss secondary to the highly vascular nature of plexiform neurofibromas. 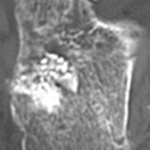 A thigh tourniquet was used, and the patient was placed into a lateral decubitus position. 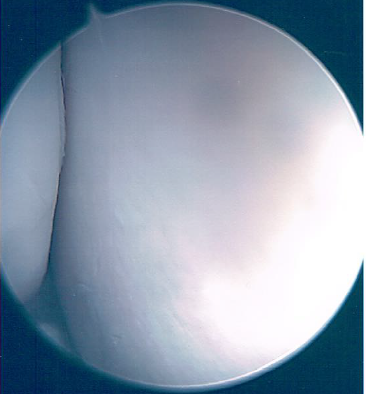 A large semi-elliptical incision was utilized, oriented in line with the mass. 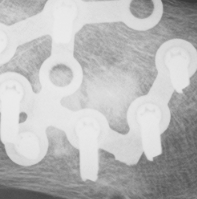 The mass was identified and carefully dissected, with electrocautery used as necessary. 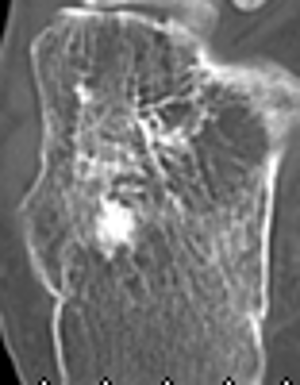 The mass was noted to readily extend through tissue planes, and was not sharply defined. 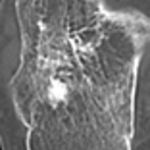 Local neurovascular structures were carefully avoided during dissection of the mass. With direct and unobstructed exposure obtained, the large mass was debulked with representative samples sent to pathology. 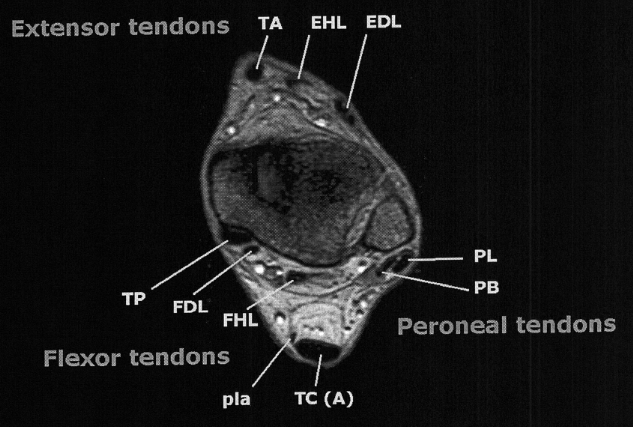 The mass was noted to extend into the peroneal tendons, lateral ankle ligaments, and the fat pad of the heel; these anatomic structures were carefully preserved during the debulking process. Following debulking of the mass, the tourniquet was released. 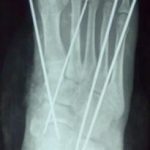 Electrocautery was again employed to assist in obtaining hemostasis. Epinephrine soaked gauze was also employed as a hemostatic agent to promote vasoconstriction, further reducing blood loss during dissection. 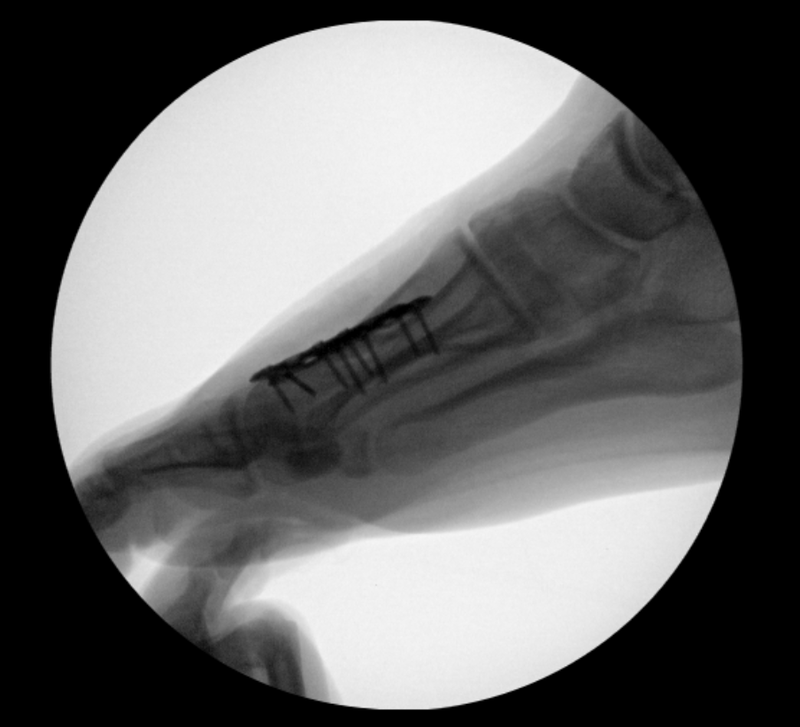 The surgical site was closed in layers, with Floseal hemostatic matrix (Baxter International, Deerfield, Illinois) applied during closure. 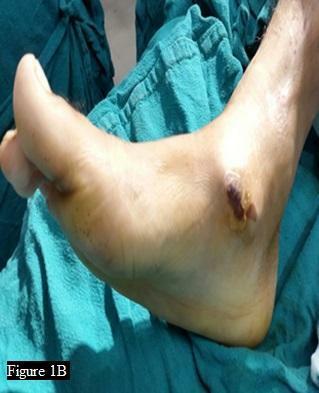 A passive, closed, surgical drain was inserted prior to skin closure (Figures 2 and 3). 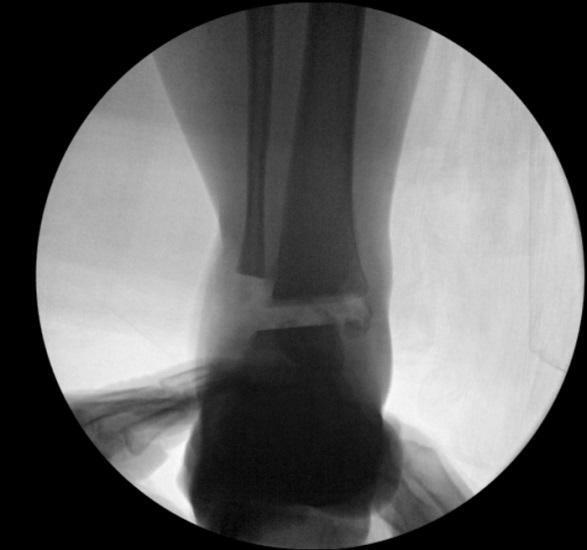 Figure 2 Immediate postoperative image of the left lower extremity following surgical debulking, with the surgical drain visible. 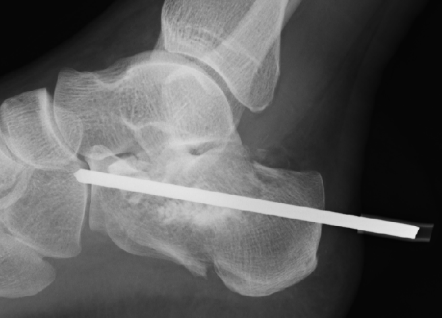 Figure 3 Postoperative image of the left lower extremity at the first postoperative visit, with surgical drain visible. 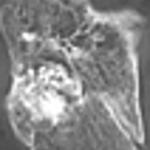 Neurofibromatosis type I (NF-1), formerly known as Recklinghausen’s or von Recklinghausen disease, is a subtype of neurofibromatosis accounting for 90% of cases . NF-1 is an inherited, autosomal dominant, single-gene disorder of chromosome 17: this non-sense mutation takes place on the NF-1 gene, with a prevalence of 1/3000 births and an equal distribution between males and females . 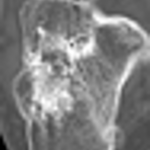 NF-1 usually presents in childhood, and manifestations include café au lait spots, neurofibromas, skeletal dysplasia, and neuropathy secondary to space-occupying neurofibromas [3,4]. 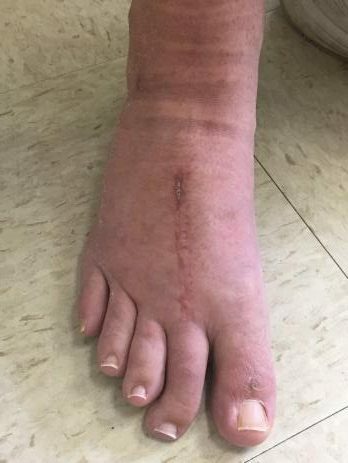 Plexiform neurofibromas occur in approximately 30% of the patients with neurofibromatosis type I . Malignant transformation occurs in about 2-16% of cases and is diagnosed with histopathologic biopsy [4,6]. 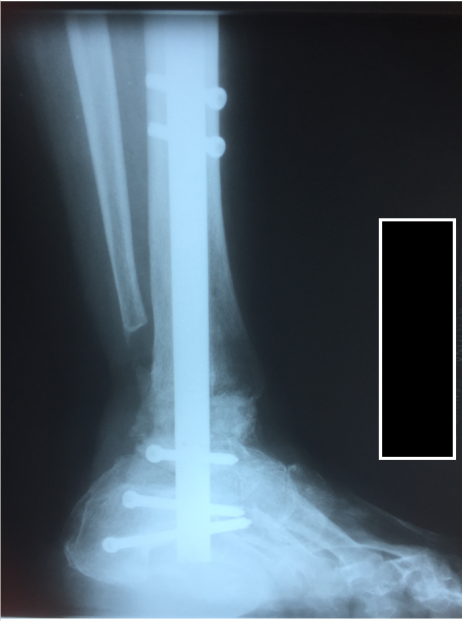 Treatment planning requires consideration of the patient’s goals of treatment, the extent of the deformity, and the presence of malignant transformation. 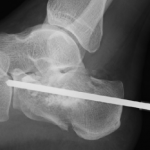 It is of vital importance to plan preoperatively in order to anticipate the atypical surgical dissection. Surgical time may be longer than anticipated, as anatomic layers will be obscured and violated by the invasive and vascular nature of these masses. 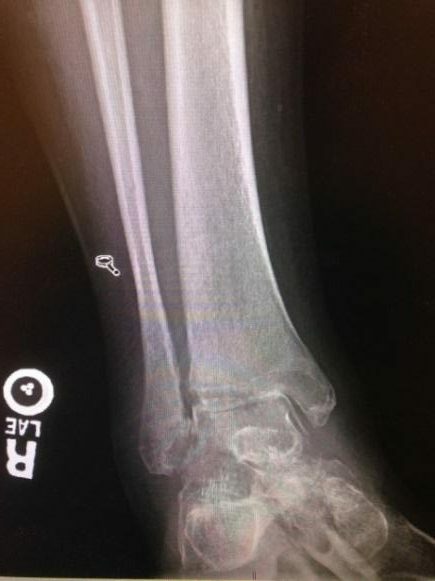 Preoperatively, blood should be typed and crossed with the anticipation of significant levels of blood loss. 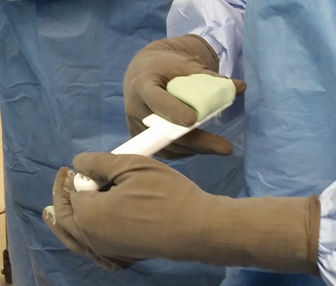 Careful, layered closure should be performed, with the incorporation of hemostatic agents. 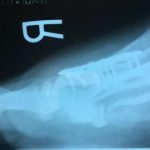 A closed surgical drain should be considered as well. 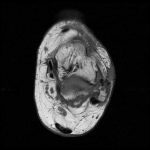 Due to the invasive and diffuse invagination of the mass, multiple tissue planes were carefully dissected with the anticipation of overall “debulking” rather that complete marginal resection of the soft tissue mass. 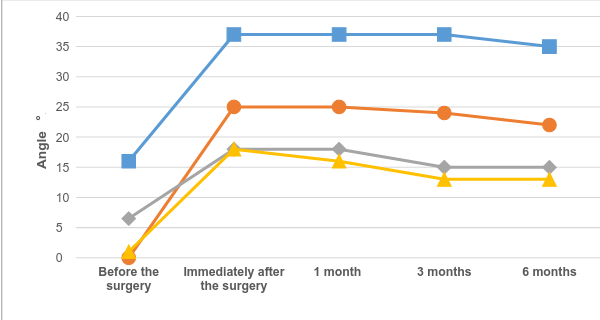 Though rarely encountered, management of large plexiform neurofibromas should include a shared-decision making process and a realistic depiction of the surgical outcome. 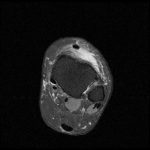 Operative management should be deferential to the highly vascular and invasive nature of these soft tissue tumors. 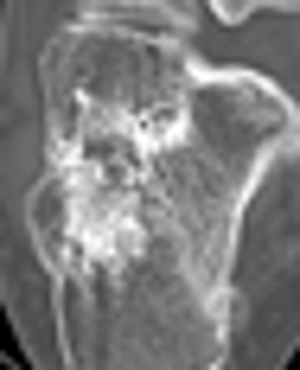 Ghalayani P1, Saberi Z, Sardari F. Neurofibromatosis type I (von Recklinghausen’s disease): A family case report and literature review. Dent Res J (Isfahan). 2012 Jul;9(4):483-8. Evans DG, Howard E, Giblin C, et al. Birth incidence and prevalence of tumor-prone syndromes: estimates from a UK family genetic register service. Am J Med Genet A. 2010;152A:327–332. Hillier JC, Moskovic E. The soft tissue manifestations of neurofibromatosis type 1. Clin Radiol. 2005;60:960–7. Neurofibromatosis Fact Sheet NINDS, May 2011. NIH Publication No. 11-2126. Huson SM, Hughes RA. London: Chapman and Hall Medical; 1994. 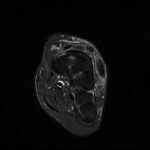 The Neurofibromatosis: A Pathogenetic and Clinical Overview. Sabatini C, Milani D, Menni F, et al. Treatment of neurofibromatosis type 1. Curr Treat Options Neurol. 2015;17:355. 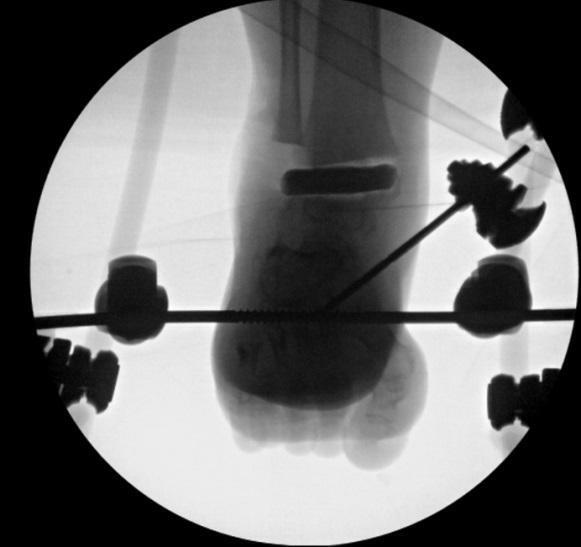 Background: A 62-year old male being treated for Charcot arthropathy of his right foot at the VA Medical Center in Orlando, FL. 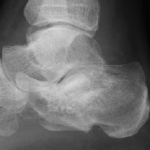 The patient was using a knee walker with a below knee cast at onset of treatment. Results: Quality of life improvements. 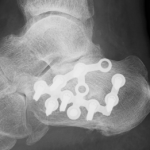 As the Charcot foot remodeled it coalesced into a foot with an increased medial longitudinal arch allowing for return closer to normal gait and footwear. 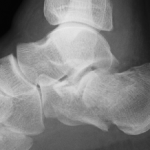 No ulcerogenesis was noted with aggressive orthotic therapy. 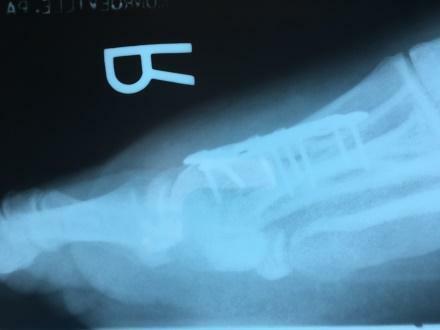 Protective sensation partially returned to feet bilaterally. Conclusions: An increase in patient quality of life without introducing ulcers. 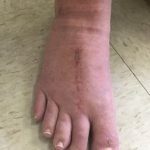 More research needs to be done to determine if this treatment protocol contributes to protective sensation returning to patients with DPN. 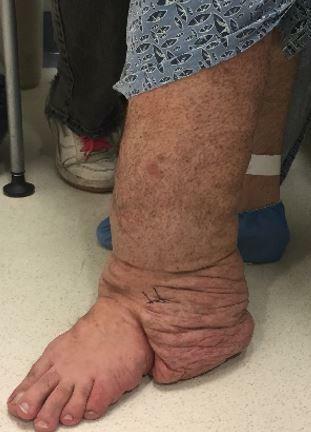 The patient is a 62-year old, well nourished, caucasian male with a 12-year history of Type II Diabetes Mellitus. 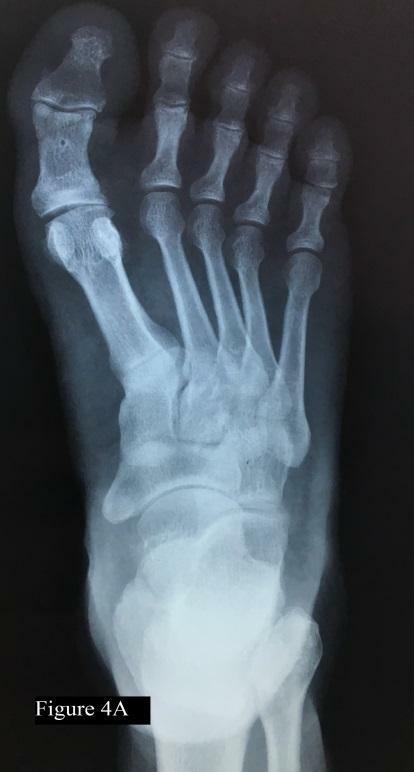 He has experienced neuropathy for 9 years and for the last 7 years he has been profoundly numb bilaterally distal to the ankle. 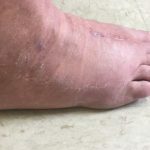 Following a 10-month period of misdiagnosis, he was diagnosed with Charcot foot on November 18, 2015, at the Orlando VAMC. 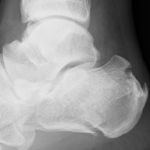 Podiatric treatment for four months prior consisted of ambulating in a BK cast with a knee walker. 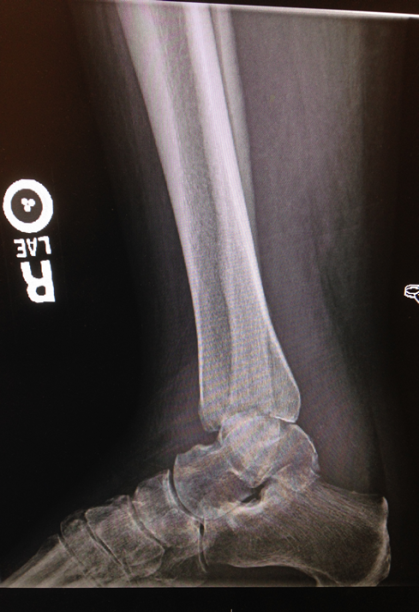 Casts were reapplied every 3-4 weeks. 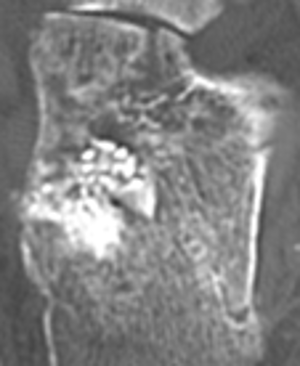 During the four months of immobilization, the patient noted considerable atrophy of the right gastroc-soleus muscle and loss of his medial longitudinal arch. 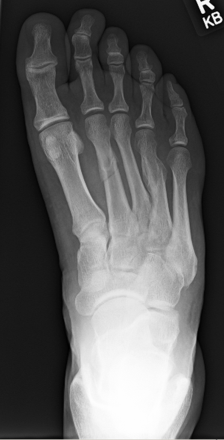 The patient’s right foot had become a semi-rigid rocker sole foot (Figure 1). 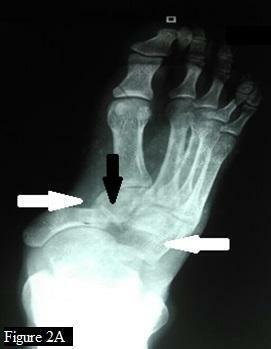 Figure 1 Rocker sole foot. 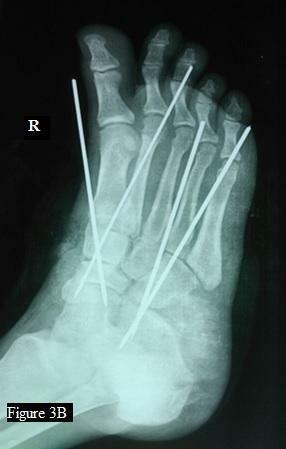 When the patient was first seen, insensitivity was confirmed with a Semmes Weinstein 5.07 monofilament test bilaterally. No ulcers were visibly present. 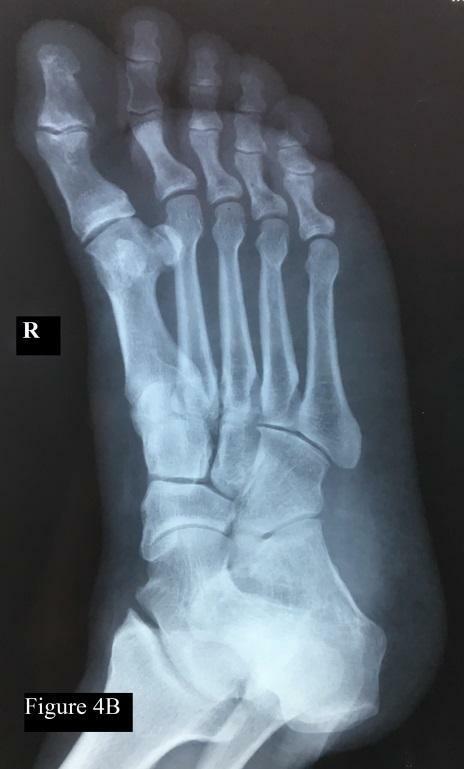 The patient’s right foot had significant swelling and the patient had gone from a size 12.5 USA (M) shoe to a size 14 USA (M) shoe prior to casting according to the patient. 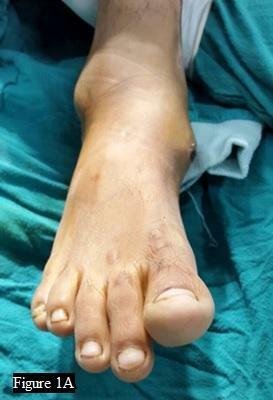 To prevent amputation of his foot, a prospective protocol was created as the patient progressed. If at any time the patient developed an ulcer, the project would have been terminated and traditional care would have resumed. 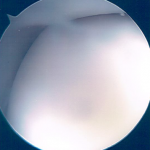 A Semmes Weinstein 5.07 monofilament was used to determine the patient’s protective sensation. 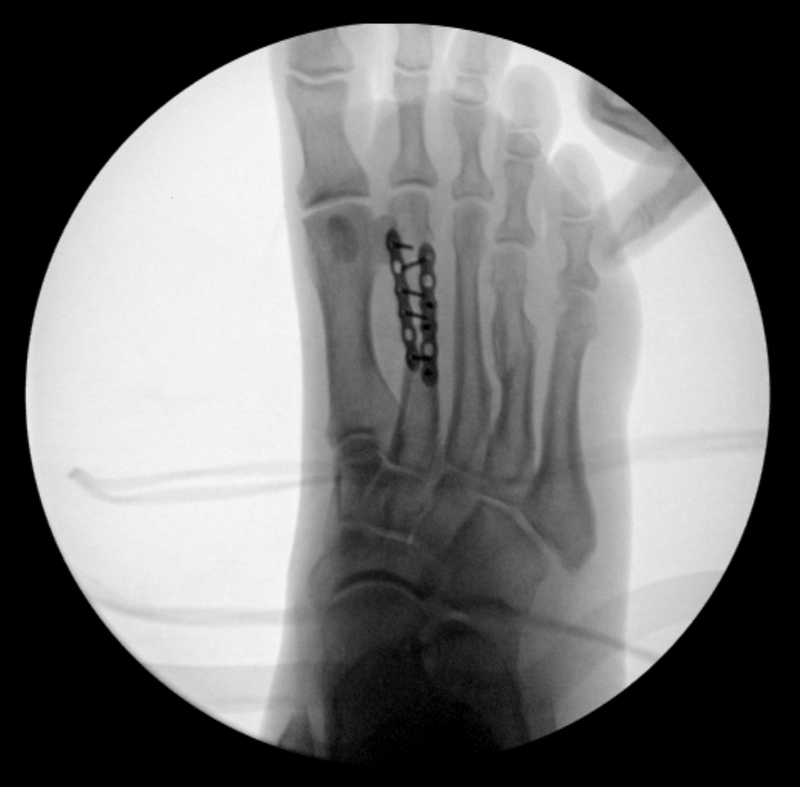 The locations for monofilament testing were as follows: the plantar aspect of metatarsal heads and distal phalanges 1,3,5. 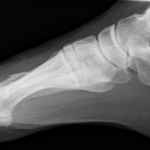 The plantar aspect of the heel, medial arch, and lateral arch. 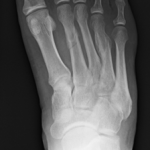 The dorsal aspect of the skin at the base of metatarsal 3, and plantar aspect of the heel, bilaterally . 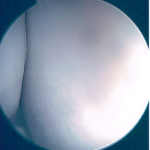 Figure 2 Paper Test shown with MASS Orthotic. 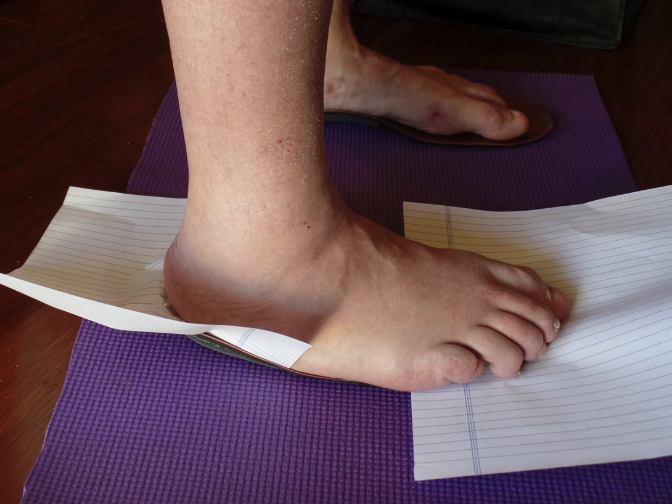 The Paper Test (Figure 2) consisted of the patient weight bearing on the affected foot with a piece of paper placed under both the forefoot and the rearfoot. 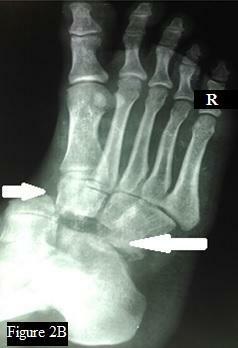 The practitioner then attempted to remove the piece of paper by pulling it anteriorly/posteriorly. If the paper tore then that was a positive result, if the paper slid out it was a negative result. 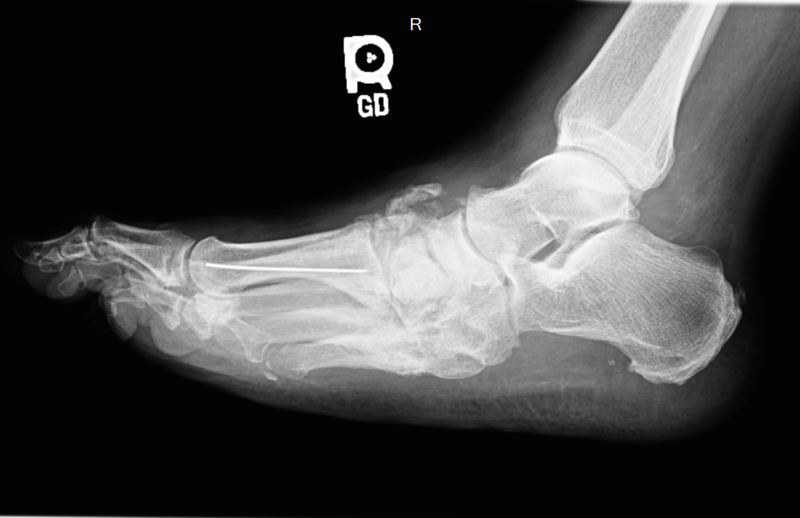 A positive result meant that part of the foot was providing adequate force to the ground, resulting in the paper being torn. 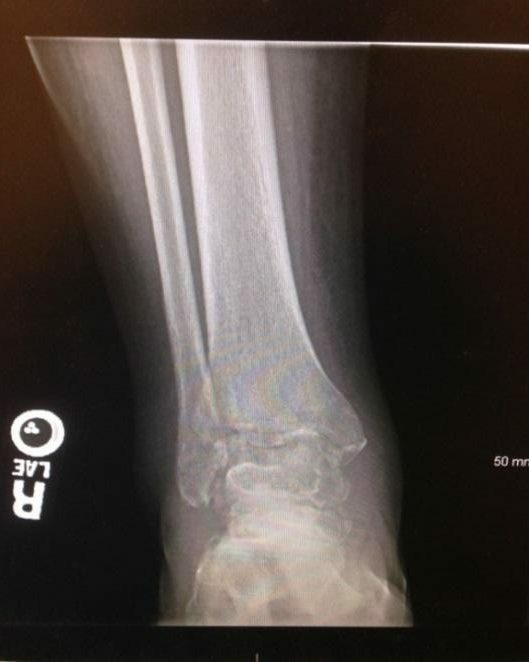 A negative result meant that part of the foot was not providing adequate force to the ground and slid out un torn. 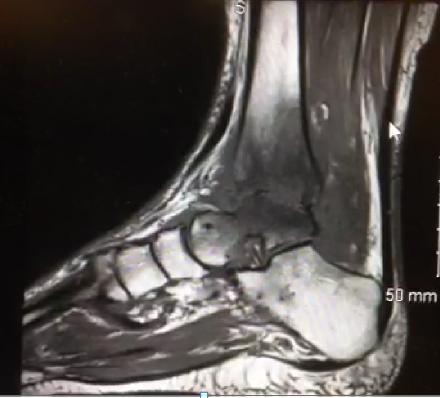 The paper test was used to determine when it was appropriate to move him from the custom MASS posture rocker sole shoe boot to the MASS orthotic inside of a diabetic shoe. 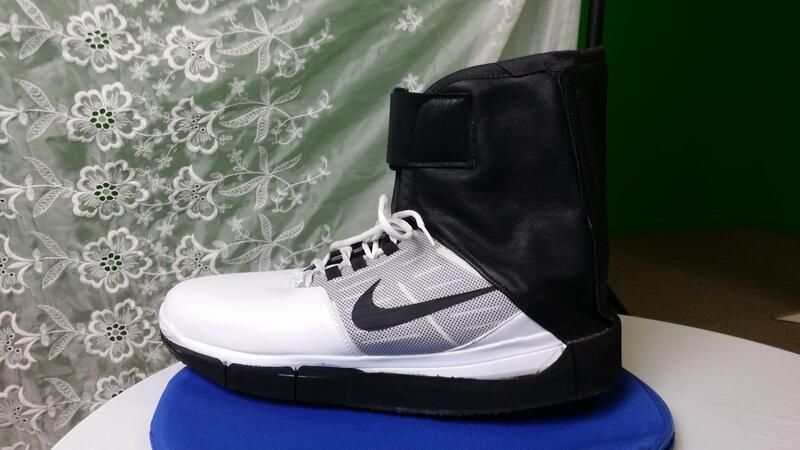 Figure 3 Custom walking boot with EVA Shell MASS Posture Orthotic. 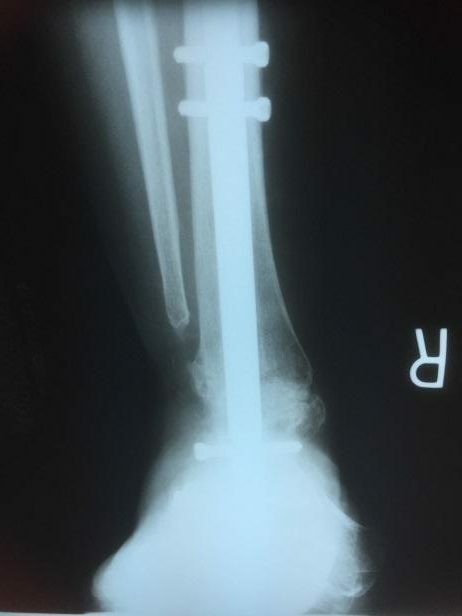 Following removal of the plaster cast, a custom rocker-sole post-op boot with an EVA shell MASS posture orthotic built in (Figure 3) on 1/28/16. 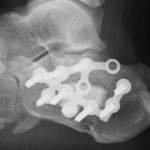 That boot caused irritation and so the design was refined and a new rocker-sole boot with an EVA shell MASS Posture orthotic fitted in the boot (Figure 4) was created and dispensed to patient on 3/4/2016. 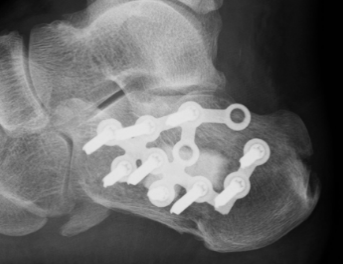 The boot (Figure 4) was removed and replaced with a modified golf shoe boot with an EVA shell MASS Posture orthotic fitted into the boot (Figure 5), which was dispensed to the patient on 3/25/2015. 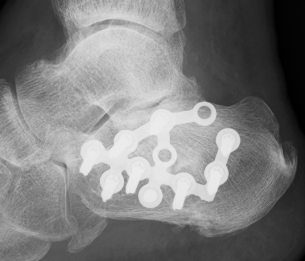 Each change of successive custom boot was modeled from a new, more aggressively captured medial longitudinal arch. 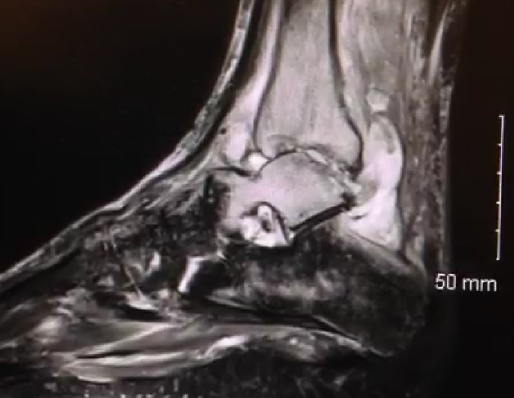 The golf shoe boot (Figure 5) was removed and replaced with an ultrahigh molecular weight polyethylene shell. 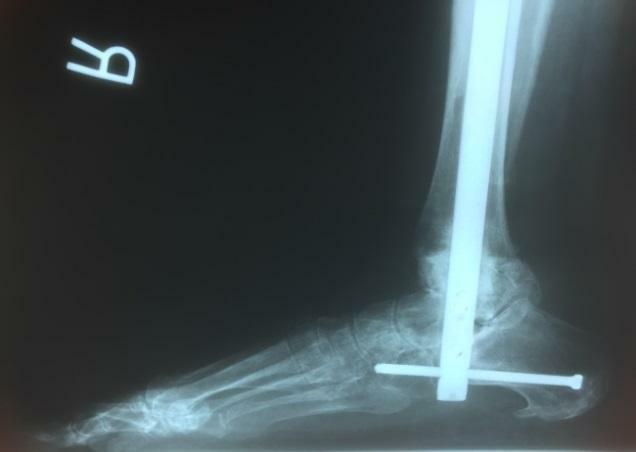 MASS orthotic (O1) for use with his diabetic shoes. 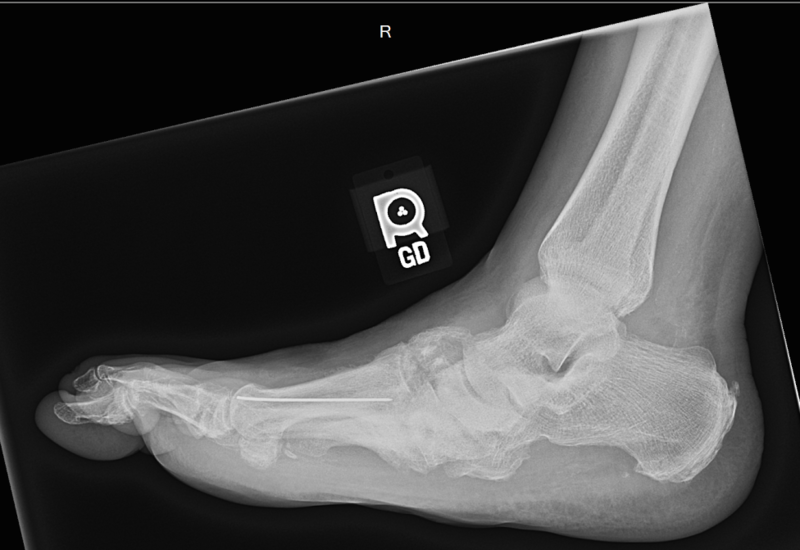 O1 was dispensed and fitted on 5/6/2016 with use of a full foot lift for his left foot to compensate for the edema on his right foot. 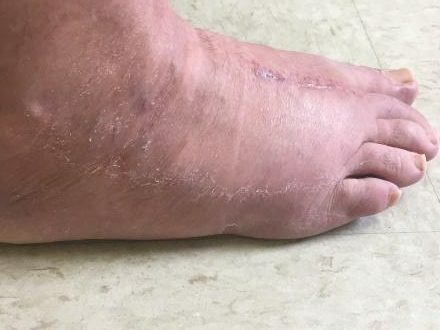 After the edema decreased another MASS orthotic with a polyethylene shell (O2) was dispensed and fitted, for his normal tennis shoes, on 8/25/2016, along with reducing the full foot lift on his left foot. 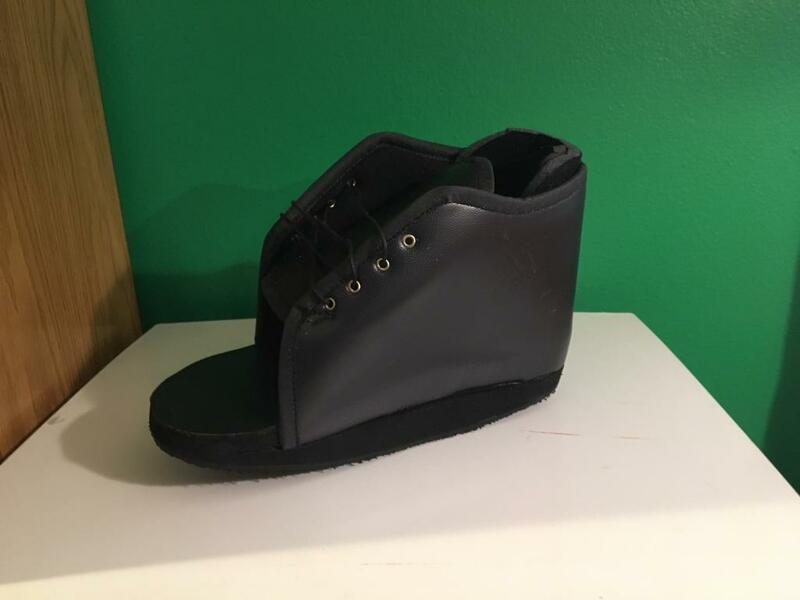 Figure 4 Refined Custom walking boot with EVA Shell MASS Posture Orthotic. 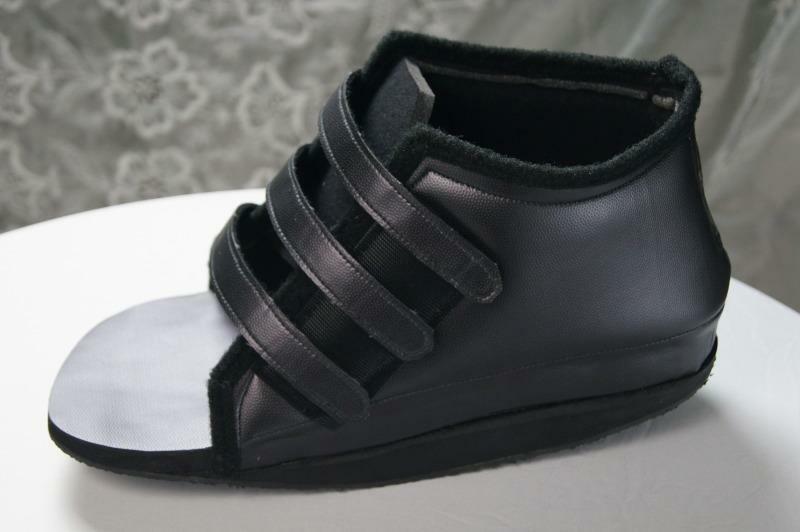 Figure 5 Modified golf shoe boot with EVA Shell MASS Posture Orthotic. 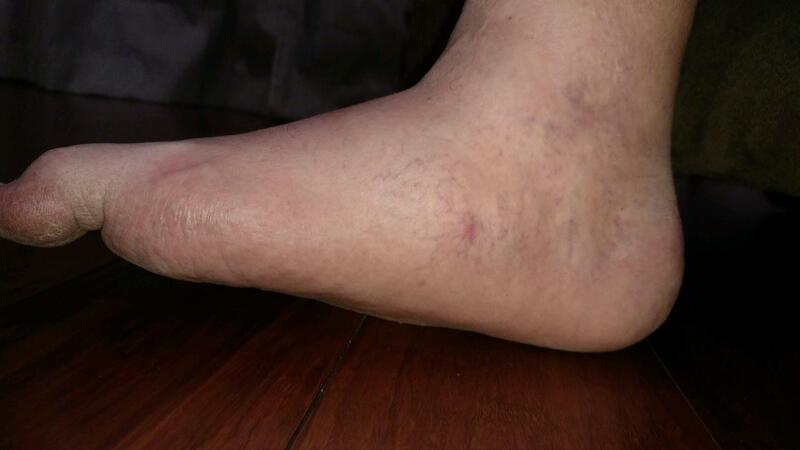 Our patient initially presented completely insensate with diabetic neuropathy on 1/28/2016. 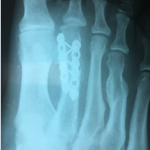 On 3/25/2016 the patient had regained 6/10 sensation on the right foot and 8/10 on left with the monofilament test. 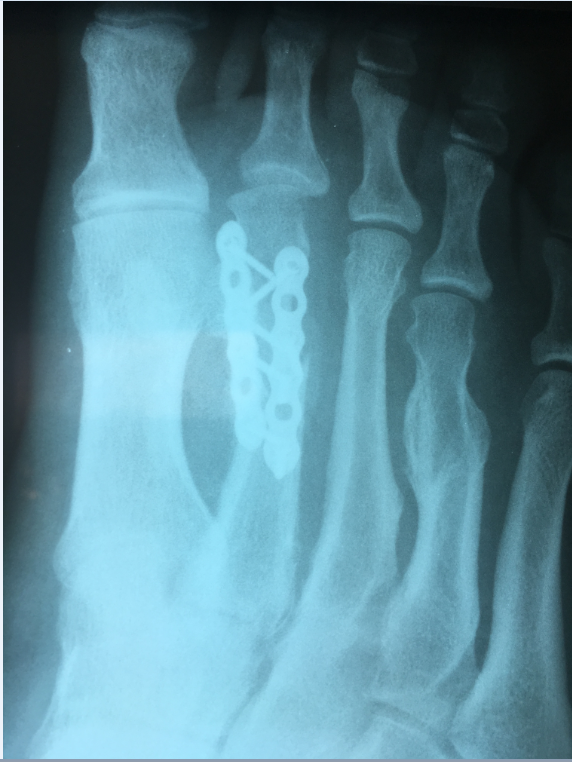 On 5/6/2016 the patient had a 8/10 sensation on right foot and 10/10 on left. It should be noted that the patient has been fully compliant keeping his diabetes in control. 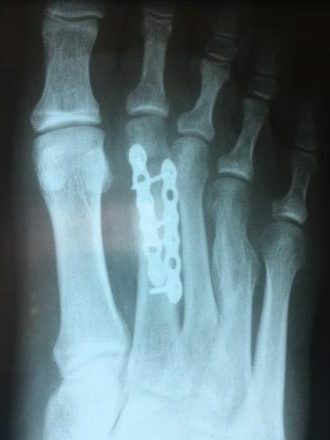 Although the patient’s Charcot foot has now fully fused, the foot appears to have remodeled and partially regained the medial longitudinal arch (Figure 6). The authors believe that this is due, at least in part, to the patient weight bearing in a MASS Posture. 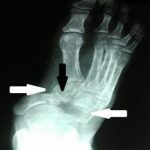 No ulcers developed with the forces applied to the foot. 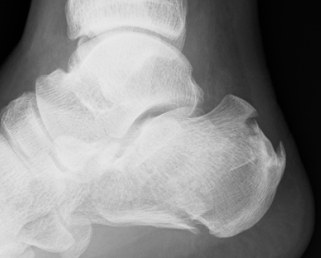 This is due, at least in part, to the even distribution of body weight across the plantar surface of the foot. 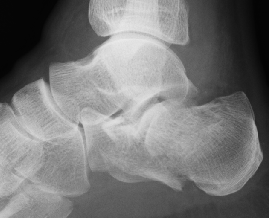 Figure 6 Clinical view of foot after treatment. 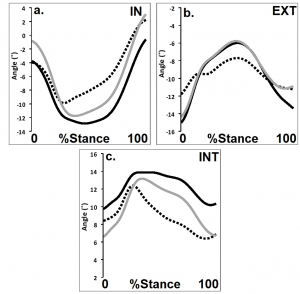 The patient is leading a normal life that includes golf and walking approximating an ideal gait cycle on both hard flat surfaces (hardwood) and uneven flexible surfaces (grass). 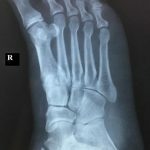 For peripheral neuropathy, it is common conventional wisdom that only the levels of Hgb A1C correlate to the presence of neuropathy. 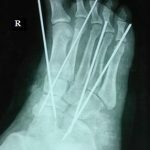 This particular case, along with previous findings of Michael Graham, suggest that there is a secondary biomechanical etiology that may contribute to Diabetic Peripheral Neuropathy (DPN). 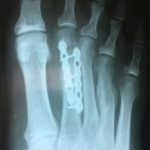 Michael Graham showed that reversing neuropathy could be obtained by reducing tension on the neurovascular bundle and the intracompartmental pressures of the posterior tibial nerve utilizing an extra osseous talotarsal implant . This helps explain why some diabetics with equally poor Hgb A1C’s develop DPN but others do not. 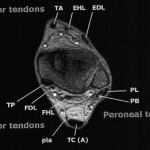 The biomechanical factor is postulated to involve the mechanical elongation of the perineurium surrounding the posterior tibial nerve. 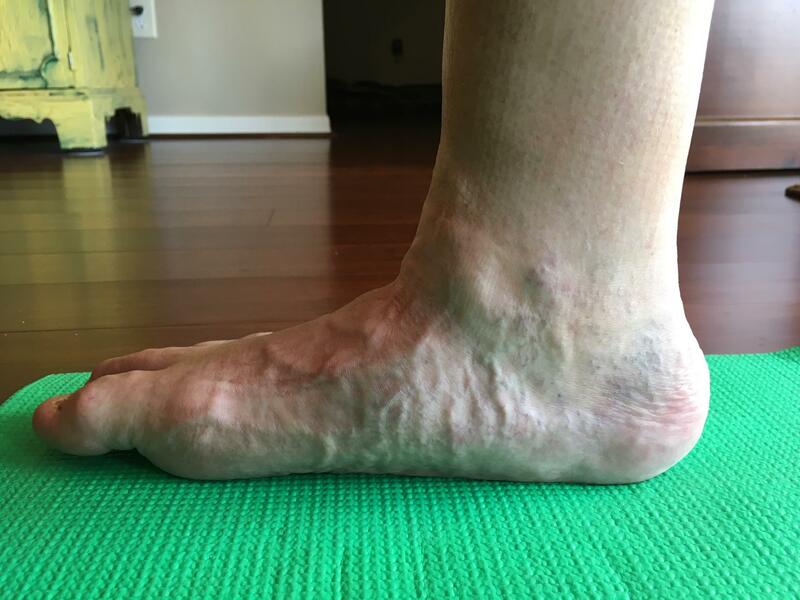 As the foot drops in posture, the neurovascular bundle is pulled plantarly increasing tension due to elongation . 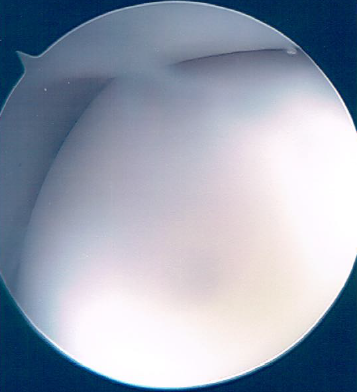 This may cause the perineurium to compress the nerve while increasing fluid pressure within the sheath, contributing to its loss of function. 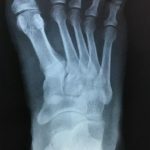 The authors postulate that using MASS Posture orthotics in combination with controlling diabetes may prevent or, in some cases reverse, diabetic neuropathy by reposturing the foot and thereby decreasing nerve tension and entrapment while evenly distributing the force from the body across the entire plantar surface of the foot. 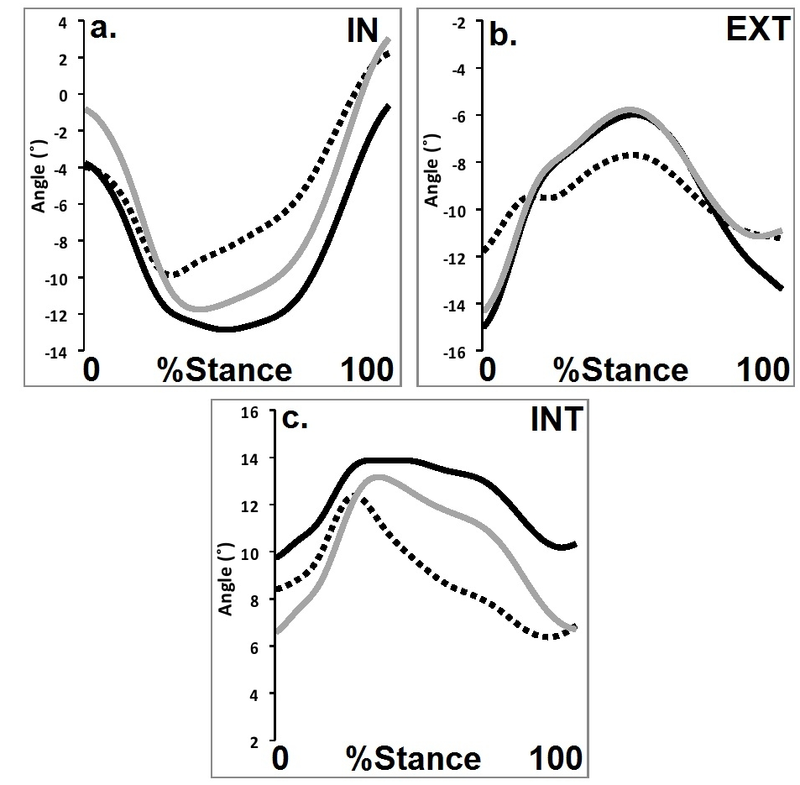 Additionally, the authors postulate that it is possible during active Charcot to remodel the medial longitudinal arch closer to an idealized foot posture. Further research is required with an established protocol prior to treatment with a larger sample size to provide more data to verify results. 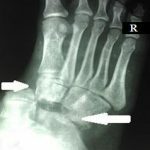 Smieja, M., Hunt, D. L., Edelman, D., Etchells, E., Cornuz, J., Simel, D. L. and For The International Cooperative Group for Clinical Examination Research (1999), Clinical Examination for the Detection of Protective Sensation in the Feet of Diabetic Patients. Journal of General Internal Medicine, 14: 418–424. Graham ME, Jawrani NT, Goel VK. 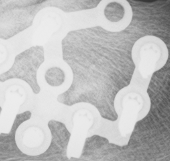 The Effect of HyProCure® Sinus Tarsi Stent on Tarsal Tunnel Compartment Pressures in Hyperpronating Feet. 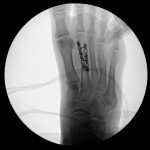 The Journal of Foot and Ankle Surgery. 2011;50(1):44-49. Graham ME, Jawrani NT, Goel VK. 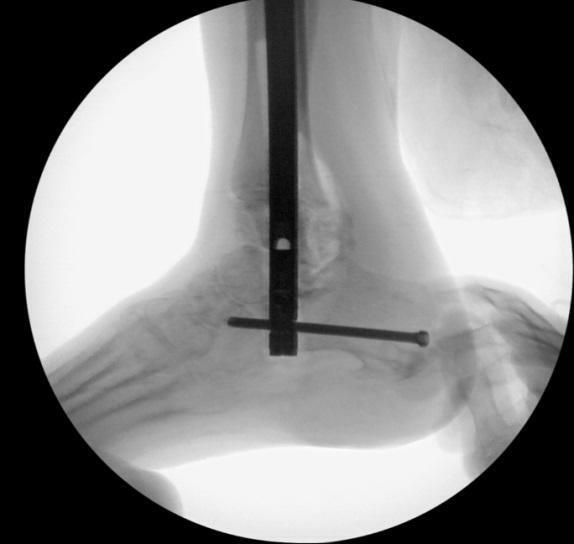 Evaluating Plantar Fascia Strain in Hyperpronating Cadaveric Feet Following an Extra-osseous Talotarsal Stabilization Procedure. 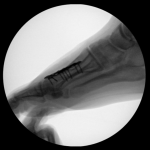 The Journal of Foot and Ankle Surgery. 2011;50(6):682-686.